Have you been lied to in SL ? How did you find out? When you found out you had been lied to, what did you do about it ? Are we all lying while using SL?.... this is the Pinocchio affect. Every person that logs in to SL uses an Avatar, these avatars may or may not resemble what we actually look like in SL... isn't this part of a lie ? 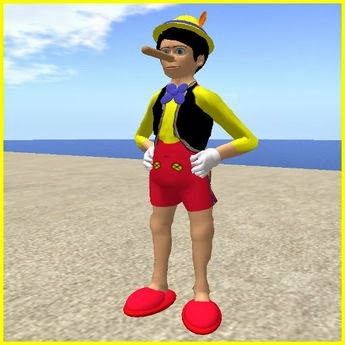 If we are not showing a true representation of what we actually look like in RL or be it that is the true fun of SL where you can look as Fat / Skinny / Tall / Short as you would like to. Some of the avatars I interviewed mentioned they had been lied to by Males pretending to be Females... eventually they acted unusual and did not want to use voice and had been caught out with their lies. Partners would use multiple alts to court other partners within SL or deceive their partners while they were AFK, while they were involved with other partners or playing around. Eventually they had been caught out in their lies either by turning up at a desired location to have their alt seen or by the information of other people in SL figuring them out. This is not what I have said I wanted. 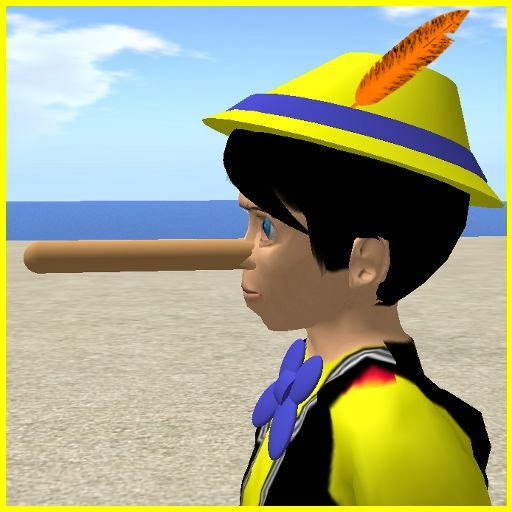 Other lies have included lying about what an avatar wants to do or what they really want – although this lie may appear minor – it can be hurtful and time wasting. How does one catch on to a potential lie ? Liars have poor memories – they simply can not remember everything that was said to ever person they have spoken with – eventually they get caught on what they have mentioned previously and hence become a liar. Another way liars get caught are by facts .... one person can not be AFK while they are dancing with another ALT in SL. One person can not do two or more VOICE calls at the same time. How do I try to protect myself ? How can you build trust ? .... ask questions and re-ask the same questions at a later date – if they are telling lies – the liar will forget and may give you different answers. Verify people where you can via VOICE – this is the quickest form of verification. If the person agrees, you can also verify details by using SKYPE, FACEBOOK and Email. Also you can talk to their friends and other people to try to verify the information they are telling you. check it out, or go with your gut instinct. Being lied to does not need to be difficult to detect, if in doubt – check it out.